This artist's illustration shows NASA's Juno spacecraft orbiting Jupiter. NASA's Juno spacecraft is scheduled to enter into orbit around Jupiter Monday night (July 4), ending its nearly five-year trek to the solar system's biggest planet. The key event Monday is a 35-minute engine burn at 11:18 p.m. EDT (0318 GMT on Tuesday), which is designed to slow Juno down enough to be captured by Jupiter's powerful gravity. 10:41 p.m. EDT (0241 GMT): Juno switches over to its low-gain antenna, which the probe will use to send status-updating "tones" during the night's maneuvers, and fine-tunes its orbit-insertion attitude. 10:56 p.m. EDT (0256 GMT): The probe boosts its spin rate from 2 to 5 revolutions per minute (RPM) to increase its stability for the orbit-insertion burn. 11:18 p.m. EDT (0318 GMT): Juno's main engine begins firing in the orbit-insertion burn, which should slow the spacecraft by 1,212 mph (1,950 km/h) and allow it to be captured by Jupiter's gravity into a 53.5-day-long orbit. 11:53 p.m. EDT (0353 GMT): Orbit-insertion burn ends. 11:55 p.m. EDT (0355 GMT): Juno begins reducing its spin rate from 5 RPM back down to 2 RPM, a process that should take about 5 minutes. 12:07 a.m. EDT Tuesday (0407 GMT): The spacecraft begins pointing toward the sun again. 12:11 a.m. EDT (0411 GMT): Juno switches back to its medium-gain antenna. 12:16 a.m. EDT (0416 GMT): The probe starts beaming detailed telemetry information (not just tones) back to Earth. It will likely take about 20 minutes to lock onto Juno's signal, mission team members have said. 1 a.m. EDT (0500 GMT): NASA and Juno team members will hold a news conference to provide an update about how the orbital insertion went. Juno's nine science instruments were switched off last week in the lead-up to Jupiter arrival. Mission team members will begin turning them back on about 50 hours after orbital insertion, NASA officials have said. These instruments will be calibrated and then used to study Jupiter over the next three months, but Juno won't be ready to begin its official science mission until it performs one last engine burn on Oct. 19. If all goes according to plan, this 22-minute maneuver will shift Juno into a highly elliptical, 14-day orbit around Jupiter. 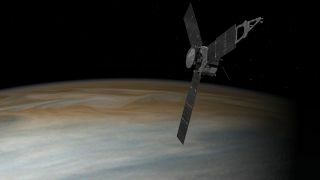 The spacecraft will then observe the huge planet over the course of more than 30 orbits, gathering data that scientists hope will shed light on how, when and where in the solar system Jupiter formed. Juno is scheduled to end its life with an intentional death dive into Jupiter's atmosphere in February 2018 — a maneuver designed to ensure that the spacecraft doesn't contaminate the potentially life-hosting Jovian moon Europa with any Earth microbes.